Curb Appeal is Worth the Work! I was doing some reading this week and was surprised to learn that of all the improvements you can make to your home, the ones that give the best return on your investment come from adding curb appeal. The return on prettifying your front yard is even better than those from a kitchen or bathroom remodel! Thankfully not all curb appeal projects need to bust your budget in order to provide a great return on your money. In fact, current trends suggest that smaller projects can be a better investment than large scale remodels (thank you very much, crappy real estate market). Even simple projects can add value to your home, and make it a prettier place to live. Giving your front door a fresh coat of paint is an incredibly easy way to up your home’s curb appeal. AND its ROI (return on investment) is almost always worth the short time it takes to paint the door. East Coast Creative has a great tutorial describing the right way to paint a front door. We painted our front door earlier this year, and I couldn’t believe the difference it made! When people, especially potential buyers, come to your house for the first time, what are they going to be looking for? The house number, of course! It seems like such a small detail, but attractive house numbers can make your home stand out immediately. You can find a wide variety of styles at your local hardware store, or you can be ambitious and make your own using this tutorial on Curbly. Soft, accent lighting makes a home look welcoming, and it doesn’t have to be expensive to add some to your front yard. Solar stake lights are available for a few dollars a piece, and just a few lights lining a walkway or flower bed make a difference. For lights that will really impress, consider installing wired accent lighting. Pretty Handy Girl explains how. Replacing existing light fixtures like porch lights and garage lights can be pricy. But even giving them a coat of spray paint can freshen them up and give them new life. There are so many ways to dress up a standard mailbox, from spray paint to magnetic decals, that it’s a crying shame for anyone to have a boring mailbox. If you want to put your creativity to work and WOW your guests, you can create a mailbox that looks like your house! Adding hardscaping to your front yard will require some elbow grease but pays off in curb appeal. If you can find salvaged materials, you can save big bucks too! Check out this tutorial for adding bricks to a flower bed. Replacing a driveway is a big, expensive job – trust me, we just replaced our driveway approach. However, you can give a concrete driveway a facelift with stain. Specially designed concrete stains can protect and beautify the driveway you already have. Young House Love outlines the process of staining their concrete patio. Even if your home and driveway are perfectly maintained, your curb appeal can still be killed by a weedy, brown lawn. Feed your grass, and up your curb appeal with these simple green lawn tips. Add some color to the face of your house with flowers, either in pots or in the ground. Annuals are a cheap, but temporary, option. Flowering shrubs and perennials will cost more out of pocket, but keep producing year after year. 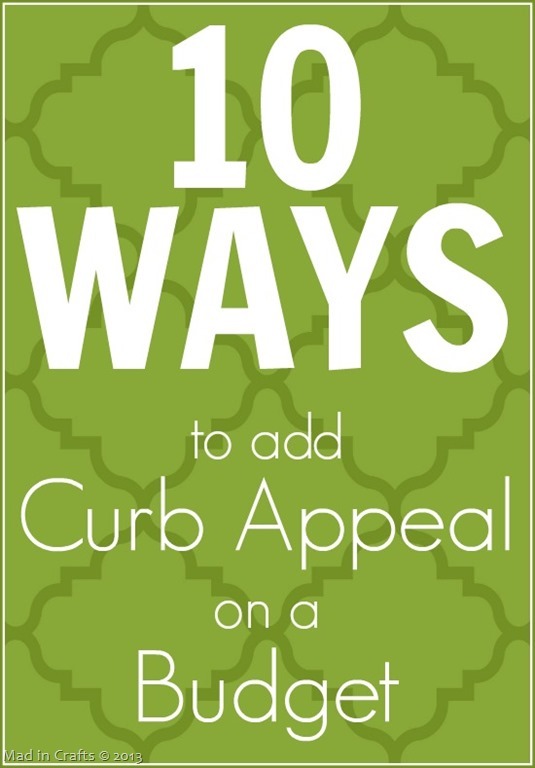 The easiest way to improve your home’s curb appeal is just to maintain what you already have. Cut your grass, weed your flower beds, sweep your porch, wash your windows. It won’t cost much more than a few hours of your weekend and can make a surprising difference. In addition to being a great way to increase your home’s value, curb appeal tends to be contagious. If your neighbors see you working hard in your front yard, they might get inspired to make new efforts on their own homes. Before you know it, your whole block is prettier AND more valuable! Do you have any tips or posts about upping a house’s curb appeal? Leave the links in the comments!